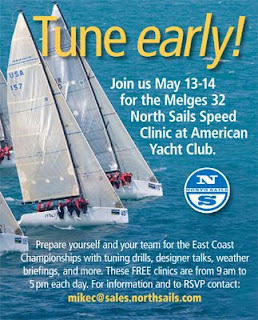 The 2009 Melges 32 East Coast Championship takes place this upcoming weekend at the American Yacht Club in Rye, NY. North Sails conducts a two-day speed clinic to help competitors prepare for a great season of sailing in the Northeast. Rye, N.Y. (May 12) - The International Melges 32 Class in coordination with the North American fleet is ready to go racing again in the USA at the 2009 East Coast Championship (ECC) hosted by the American Yacht Club (AYC) in Rye, N.Y. on May 15-17. This is the third year that the fleet has conducted such an event and looks ahead to an exciting weekend of competitive sportboat racing. Seven top-notch teams will feature some of the best talent the sailing world has to offer. Gavin Brady will call tactics for Jim Swartz (Edgartown, Mass.) on USA-007 Q; Anthony Kotoun will serve as tactician aboard John Taylor's (Jupiter, Fla.) USA-1315 Ninkasi; and Max Skelley will offer his expertise to Geoff Pierini (Bernardsville, N.J.) on USA-178 Shakedown. Jason Carroll (New York, NY) on USA-128 Argo will be under the careful guidance of John Baxter; Tony Rey will saddle up with Kip Meadows (Rocky Mount, N.C.) on USA-77 roXanne and Alex Jackson from Riverside, Conn. on USA-174 Leenabarca will not have to travel far to compete with Brad Boston calling the shots. Last, certainly not least is Edward Tillinghast (New York, N.Y.) on USA-151 Dark n' Stormy with Steve Benjamin on tactics. Making the ECC unique and following in the footsteps of the very successful Gold Cup Regatta held in December 2008, Saturday has been designated as Take A Junior Sailing Day. A few of the Northeast's most talented junior sailors will have the chance to socialize with and compete against some of worlds biggest and brightest sailing super stars. This effort is a true testament to the International Melges 32 Class Association's quest to grow and share the sport of sailing on an unprecedented level with aspiring junior sailors. Teams are in full preparation mode, not only for the intense race days ahead, but also for a terrific two-day speed clinic presented by North. This exclusive opportunity starts on Wednesday, May 13 and concludes on Thursday, May 14. A robust curriculum will specifically target Melges 32 tactics and boat handling maneuvers. Rig tuning, speed testing, starting practice, mini races and local knowledge sessions are all topics slated to be covered. 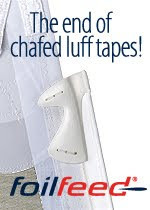 The East Coast Championship is the first in a string of high-profile events scheduled for the 2009 Melges 32 Summer racing season. The fleet moves to the Midwest to kick-off the Great Lakes Gold Cup Series comprised of the Chicago NOOD on June 19-21, the Harbor Springs Championship on July 31-August 2 and third is the Verve Cup on August 13-16. In between, the fleet will migrate to the West Coast for the 2009 Melges 32 U.S. National Championship on July 24-26 hosted by the California Yacht Club in Marina Del Rey, Calif. as it works its way toward the 2009 Melges 32 North American Championship hosted by the Sausalito Yacht Club on September 6-8 in Sausalito, Calif.